Going through one of my closets and found a forgotten gem. I believe it is a Robbins-Meyer #1404, circa 1910. It is missing the brass cage and struts. 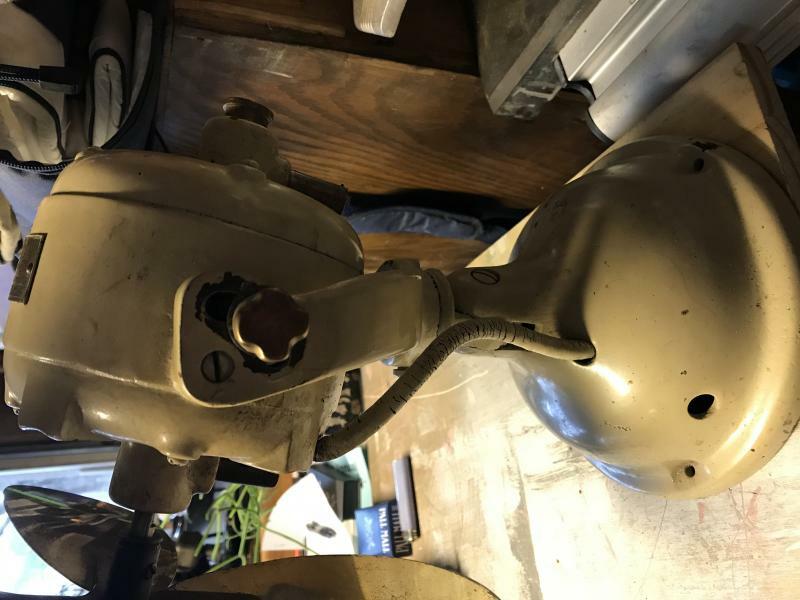 Anyone out there have for parts sale or willing to fabricate for a small fee Don't have a picture, but in looking at the Gallery I'm certain that is correct. Any information on if this came originally in Ivory? I picked this up back in the early 90's from my fading memory, but don't remember the details. It appears to be original paint, but may just be an old restoration. I'll take a picture and post later. Thanks! The 1404 and 14040 were made from 1911 through 1917 using three different brass cages. The 1911 model used the identical cage as the lollipop then the cage was changed to a two ring cage. If your fan has rubber feet it's a 1404, if felt covered base plate it's a 14040 that was made after the 1404. I don't think there is a way to tell years of the 1404s or to know if they might have been offered in ivory or colors. These are really, really good fans. Thanks for the link. After reviewing my fan a bit closer I have come to the probable conclusion someone a long time ago repainted this fan. There is overspray on the head wire, on the switch and on the windings. Also as you can see from this picture the motor tag has a bit of overspray. The model # stamped appears to show to be a #1404, though interestingly there is a 5 stamped over the 4 as well. Some sort of factory error. In reviewing the link I noticed the side wing nut is different on my fan. It is rounded, not the typical wing nut. Not sure what this tells me as I saw no mention of this in the attached link from Steve. Anyone want to chime in on the proper cage for this fan????? Also I noticed a couple of other issues. The switch lever is broken and I will need to get this fixed to make operable. Also the blade measures 15-1/2" across, so is likely incorrect as well from stamped model #. Your tag stamper must have picked up the wrong digit. 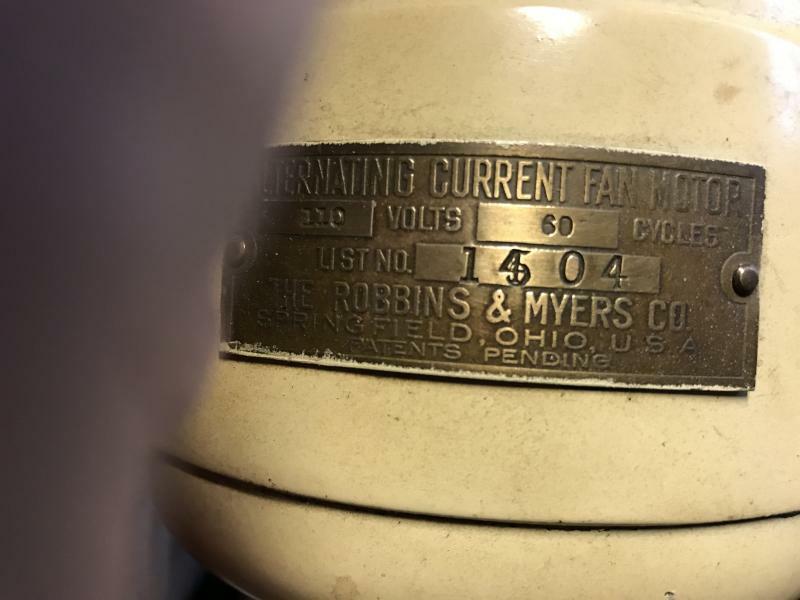 The DC fans equivalent to the 1404 were list 15xx but the motor tag was embossed DIRECT CURRENT. Someone made copies of the correct R&M tilt lock wing screw as well as copies of the rotation wing screw a few years ago. Not sure who. Maybe Ted Kaczor or antiquefanparts.com You might inquire from Chad there or he might have an original. I don't think there is a way to tell what year your fan is; they all look the same to me other than the felt base ones with a 0 added to the tag list no. You could probably choose either cage you prefer and who could say that it's not correct? Ask Rick Robinson, a big R&M collector, if he might know how to tell a 1911 model from the other years. Only the 1911 model 1404 (first year) had a different cage, identical to the R&M cage on the lollipop. Page processed in 0.1591 seconds (18% database + 82% PHP). 28 queries executed.